A little background into MangoEats here - this eating obsession of mine started with me eating OTHER people's food. Restaurants primarily. I got to a point where dining out was almost ritualistic and something I longed to share with my friends or family. With the right size group and the right people at the table; a perfect meal from looks to taste was sure to shored up with inside jokes and catching up. Dining out makes for some memorable times. I have dedicated 2017 to spending with myself, my family and friends. I am making concerted efforts to meet up with old friends I haven't laid eyes on in ages. What better way to catch up and be reminded of why we became friends in the first place than over a meal. One of my earliest experiences this year was with a friend and fellow blogger who we'll call Berry. She's the lady behind The Very Sweet Lifestyle and a friend I met many moons ago on a popular Nigerian message board over a decade ago. We ventured off to one of the restaurants on my list - The Public House in Vinings, just on the edge of Atlanta. I must confess, I was a little concerned as it was a bit hard to find in the lobby of a hotel that was easy to miss. We sat near the windows for optimum lighting and premium people watching. We were not disappointed. The thing about hanging out with people you like is that you have a lot of things in common. On this day, we both wanted the same things, so we essentially ordered the same thing. No matter, it was all VERY good. 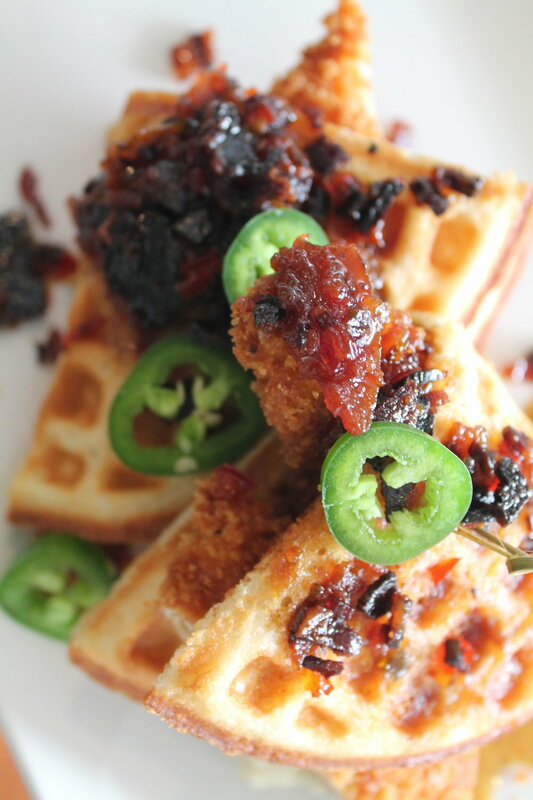 We spied the spicy chicken and waffles and knew instantly, I mean LOOK AT IT!!! I don't have much to add when it comes to ambiance as I noted earlier, it's literally just to the left of the hotel's lobby. Much brighter near the windows with a full bar available to you. Our host was pleasant and knew what I meant when I said "spicy" (spicy and hot are different folks! ), and knew that we did not need to be disturbed frequently. Our classes stayed full and we throughly enjoyed our meal. If you're in the Vinings are, check out The Public House and take a stroll down to their shops after. It's just off a busy street in a cute area. You'll enjoy it.